An interval interpolating polynomial is the interval function that explicitly represents the set of all real polynomials of degree interpolating through all points from a set of vertical segments in the plane. The set of all real algebraic polynomials of degree interpolating all possible sets of points where can be represented explicitly by an interval function, called interval interpolating polynomial. 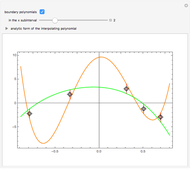 At any point the value of the interpolating polynomial is an interval. Each vertical segment in the present Demonstration is generated as where the point with coordinates is represented by a locator. 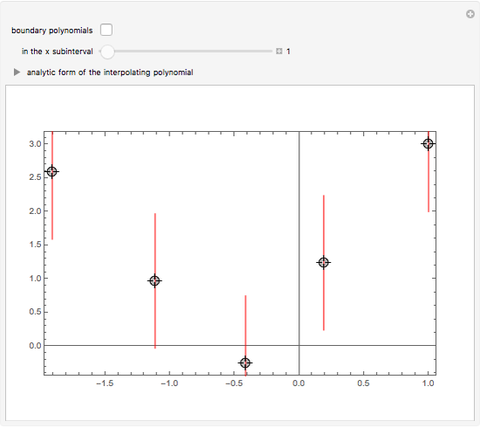 Drag the locators or create/delete locators to change the vertical segments and see how the interval interpolating polynomial (in its graphical or analytical representation) changes. 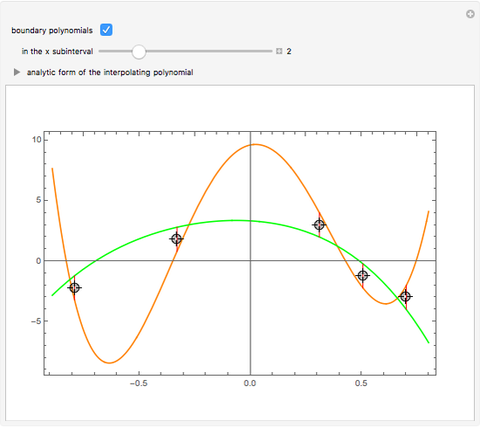 The boundary of the interval interpolating polynomial consists of piece-wise real interpolating polynomials defined by particular end points of the intervals for each subinterval Move the subinterval slider to see the corresponding slice‐boundary real interpolating polynomials—one colored in orange and the other in green. 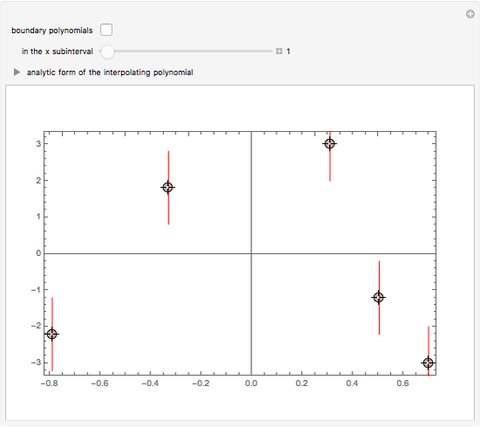 The family of real polynomials interpolating all points in a given set of vertical segments can be investigated without using interval arithmetic . 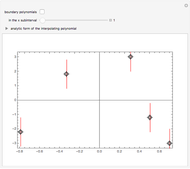 Other material related to the interval interpolating polynomial, including a more general setting, can be found, for example, in , . Another approach that is different to the interval function representation is called parameter set representation. Some material related to this approach can be found in . M. A. Crane, "A Bounding Technique for Polynomial Functions," SIAM J. Appl. Math., 29(4), 1975. J. Garloff, "Optimale Schranken bei Intervallinterpolation mit Polynomen und mit Functionen ," Z. Angew. Math. Mech., 59, 1979 pp. T59–T60. M. Milanese, J. P. Norton, H. Piet-Lahanier, and E. Walter (eds. ), Bounding Approaches to System Identification, London, N.Y.: Plenum Press, 1996. J. Rokne, "Explicit Calculation of the Lagrangian Interval Interpolating Polynomial," Computing, 9, 1972 pp. 149–157. 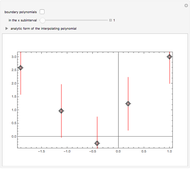 Evgenija D. Popova and Radostin Surilov "Interval Interpolating Polynomial"